I teach philosophy to undergraduate and graduate students in a college of visual arts and design. Teaching philosophy in this location possesses unique difficulties and possibilities for philosophy teachers. In particular, I deal with students who (a) lack a background in philosophical knowledge or philosophical skills and (b) are trained in the visual arts rather than in a humanities-oriented, text-based tradition. 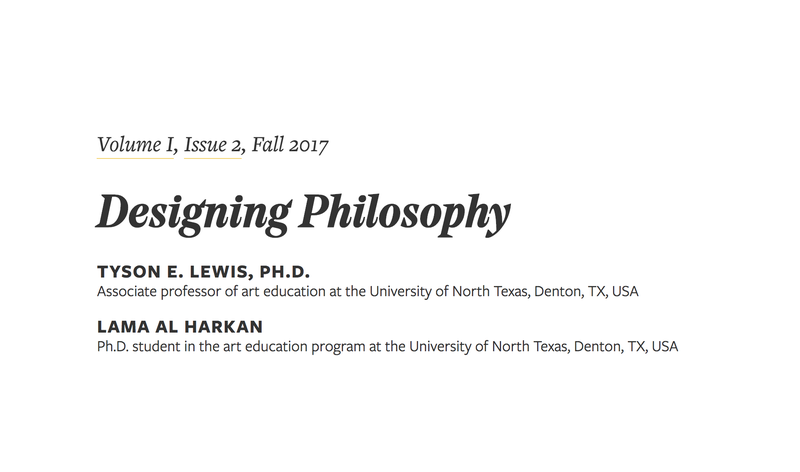 At the same time, teaching within a college of visual arts and design also affords unique opportunities to think differently about one’s teaching practices (and perhaps about philosophy as such). Indeed, over the last several years, I have become increasingly interested in the connections between words and images and how the verbal and the visual interact with one another. In the rest of this brief article, I will focus on a particularly fruitful example of crossing the verbal / visual divide through the use of information graphics, also referred to as “infographics.” I hope to illustrate how infographics are situated at a point of intersection that allows for translation of words into images and vice versa, thus offering a powerful pedagogical supplement to text-based inquiry models. I will then provide an example of an infographic which I co-designed with an art education graduate student who was enrolled in my seminar on phenomenological research methods (here listed as co-author of this article). The use of literary / poetic imagery to teach philosophical reasoning or to address philosophical concepts is ancient. We might recall Plato’s use of the cave or the myth of metals to convey complex ideas to those who might otherwise be excluded from participating in philosophical dialogue. Also of note might be the imagery found in the writings of Nietzsche, especially in his masterwork Thus Spoke Zarathustra. The philosophical novels and plays of Sartre, Camus, and, more recently, Alain Badiou also suggest a tight connection between literary imagery and philosophical argumentation. Unlike theories of images (as in Barthes’ Mythologies), these authors write philosophy through imagery. But such imagery remains within the realm of language. What about using visual images, and not just poetic imagery, to teach philosophy? In the twentieth century, phenomenology is perhaps the only school of philosophy that has consistently turned toward the visual arts to answer, not simply ask, philosophical questions Yet given this relationship, few have systematically inquired into how images can help (and perhaps hinder) the teaching of philosophy. In an attempt to answer this question, authors such as Daniel A. Dombrowski have persuasively argued that using visual images to teach philosophy has its benefits There are two reasons for this. First, as we all know, it is easier to intuitively grasp a visual image than it is a string of words or propositions, in a formula, argument, or paragraph. Second, images have a tendency to stick in the mind. Thus, as Dombrowski summarizes, “… what a visual presentation of philosophy lacks in depth and subtlety of meaning it makes up for in accessibility and mnemonic endurance, what are boons to any teacher”. He then goes on to illustrate this point with reference to his use of Raphael’s famous painting The School of Athens in his own classroom practice. But Dombrowski also highlights the limits of relying on images to teach philosophy. He thus states, “Explaining Hegel through visual images may be impossible”. Although Dombrowski does not go into details as to why this might be impossible, we can speculate that it is because of (a) the complexity and density of Hegel’s work and (b) because the philosophical concepts contained in Hegel’s dialectic unfold in time and thus are inherently dynamic. As such, Dombrowski seems to imply a classic split between time and space, a split that is also inherent in the long history of discussions relating to word and image The image is spatial whereas the word is temporal, thus creating a division between the two—a division which more often than not privileges the temporality of the word over the spatiality of the image. The question that emerges here is: Are there pedagogical limits to the use of images for teaching philosophy? If philosophy unfolds in time whereas images appear in space, then do the limits of one run up against the limits of the other producing certain pedagogical miscommunications? In an attempt to teach Martin Heidegger’s classic text Being and Time to a group of studio artists, art educators, and communication design students, I found myself in a particularly efficacious position to explore these questions and to put to the test Dombrowski’s thesis concerning the limits of using images to teach philosophy. Heidegger’s book is textually and conceptually dense and richly multidimensional even for the most advanced philosophy students let alone a group of visually inclined novices. When creating the syllabus for a course in phenomenological research for a college of visual arts and design, my first inclination was to leave Heidegger out of the picture entirely. I felt that the writing would be too opaque for the students and that it might be more philosophically and educationally apt to focus on secondary literature, primarily from the social sciences, to give them the tools to engage in basic phenomenological research. Yet this approach was distressing to me. On the one hand, it might very well get them in the field, using phenomenology quickly. On the other hand, the room for abuse of phenomenology seemed greater if students where not first carefully and slowly introduced to the philosophical texts informing the development of specific research methods. Such a warning has been previously offered by qualitative researchers who write on phenomenology and stress its fundamentally philosophical roots But to commit to teaching Heidegger meant that I would have to spend a significant amount of time dwelling with Being and Time, for one cannot simply jump into such a text. I thus decided to dedicate about half of the semester to reading and discussing Part One of Being and Time, with the assumption that a firm grasp of the basic analytic of being-in-the-world provided by Heidegger would help students understand (a) the stakes of phenomenology and (b) provide a solid foundation for empirical research. What I quickly discovered was that the largest hurtle was neither the density of the writing nor the project of phenomenology as such but rather the scope of the book as it unfolded. Students quickly became lost. They were unable to hold together all the facets of the analytic as Heidegger moved back and forth between analysis of various dimensions of human being-in-the-world and larger, more holistic structures that bound all the various dimensions together. If, for Heidegger, the most essential feature of our being-in-the-world is its unity and holism, then students were quickly losing their footing. Details of particular chapters could be grasped with clarity, but how these details then fit within the overarching structure of being-in-the-world remained obscure. Because of this frustration, I found myself grasping for innovative pedagogical strategies to help. Intuitively, I started drawing graphs of the book that combined words and symbols. Neither prose nor visual image, the result was something else entirely. It was at this point that one of my graduate students who is trained in design introduced me to infographics. Infographics concern the visual design of information systems, allowing us to perceive complex patterns and sets of relations between concepts, metaphors, ideas, as so forth. Theorists such as Banu Inanc Uyan Dur stress how communication design is coming to play a crucial role in navigating through our information saturated world The infographic is one tool that can promote both analysis and synthesis of concepts found within informationally dense systems. Ideally, the infographic has the potential to make salient important qualities of a phenomenon in a comprehensible fashion—important qualities that might otherwise be drowned out by the information barrage that all of us encounter on a daily level. 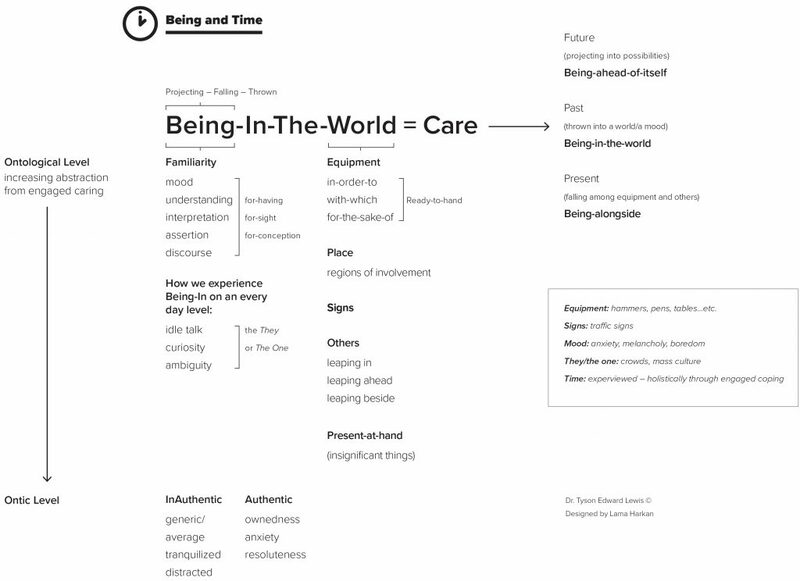 In this sense, the infographic is an attempt to solve not merely a design issue but also a pedagogical issue: how to be attentive / take care of what is important and meaningful in a world where meaning is easily lost. While current research on infographics conceptualize them as a kind of filtering and focusing device in an informationally saturated world, I would like to point out that the infographic can also help students in classrooms navigate the complexities of philosophical thought / textual analysis, and thus intervene into the teaching of the humanities on university campuses. Although infographics are often thought of as pedagogical tools for the sciences, there are some who are now using infographics to help K-12 students critically engage with literature, and to help students philosophically reflect on their ethical beliefs and value systems Educators in schools are thus beginning to recognize the importance of communication design and visual thinking to help students engage in text-based ideas within a world that is undergoing a “pictorial turn”, yet such pedagogical practices are less common in humanities classrooms in higher education, or at least there is less written about them. Infographics can, in short, help design philosophy with an eye toward pedagogical facilitation. To design philosophy means translating verbal communication into visual communication with sensitivity toward visual readability and accessibility. In this sense, I am not speaking about design’s own philosophy, but rather about how design principles can help teachers open complex texts to visually acute students. Using a mix of design elements, writing, images, maps, and illustrations, the infographic can orient students toward the structure of an argument, central themes, core beliefs, and essential plot points. In other words, a successful infographic can help remind students what is worthy of being cared for in any given context of thought. Unlike formalizing analytic proofs in philosophy, the infographic does not rely on standardized symbols or formulae. Instead, there is much more creative leeway to experiment with verbal and visual imagery find a graphic representation of the desired content. Conventions can be tailored to the specificities of the texts or problems or audiences that are being dealt with. As such, infographics are incredibly versatile and flexible.